Coupling airlines and forests would be a match made at cruising altitude. Airlines will need lots of emission reductions to meet their goal of growing business without growing emissions. Meanwhile, tropical forest protection offers a big and affordable potential source of emission reductions, but requires large and reliable funding, as Frances Seymour and I describe in our forthcoming book, Why Forests? Why Now? The Science, Economics, and Politics of Tropical Forests and Climate Change. 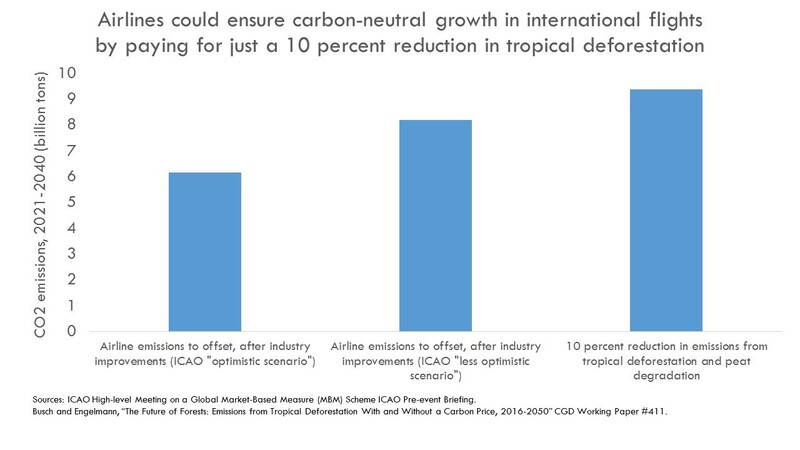 Indeed, as described below, airlines could make the growth in international flights carbon neutral for 20 years by paying for just a 10 percent reduction in future emissions from tropical deforestation. The vast bulk of climate emissions are dealt with internationally through the United Nations Framework Convention on Climate Change (UNFCCC), through which the Paris Agreement on climate was successfully agreed last year, and through which voluntary national climate pledges were made. However, a few other international forums handle for greenhouse gas emissions too. The International Maritime Organization are responsible for emissions from international shipping; the Montreal Protocol takes care of CFCs and HFCs. And ICAO, a consortium of national governments and airlines, is responsible for emissions from international flights (domestic flights are covered by countries’ commitments through the UNFCCC). International flights currently produce around 2 percent of all greenhouse gas emissions, but the International Energy Agency has projected these emissions will more than triple by 2050. ICAO set an aspirational goal back in 2010, reiterated in 2013, to cap future emissions after 2020, with “carbon neutral growth” from then onward. This means that between 2020 and 2040, by ICAO’s estimates, the industry would need to prevent the release of around 10 billion tons of carbon dioxide—roughly the amount emitted by Australia over the last 20 years. Now ICAO is discussing how to meet that target. Commit to a strong collective target. First, representatives in Montreal should look for ways to strengthen their previously stated collective goal of carbon-neutral growth post 2020, compatible with limiting the world’s temperature increase to well below 2 °C or even 1.5 °C. A target in which emissions are capped at a lower level is stronger, for example; so is a target in which emissions ramp down over time rather than just avoiding future growth. If the Paris pledging process is any indication, we may be repeating the phrase, “half a loaf is better than none.” That is, let’s get started with a goal that’s politically ambitious, in the hope that emission cuts will then become cheaper and easier than anticipated, leading to larger cuts consistent with scientific necessity. Like the Paris Agreement, the ICAO proposal includes a periodic review to strengthen commitments. Maximize participation. An agreement at ICAO to cut emissions appears likely to be voluntary rather than mandatory, at least for the first few years starting in 2021. So the success of the agreement depends on how many countries’ airlines choose to participate. Competitiveness is even more of a concern for airlines in Montreal than it was for countries in Paris; no company wants to be placed at a disadvantage relative to its competitors in other countries. Thus to be successful the agreement needs to be joined by countries’ airlines representing a high percentage of total industry-wide emissions. Exemptions are justified for airlines from the poorest countries, and may be ceded to landlocked or island states as well. But other countries should follow the lead of the United States, China, Indonesia, Canada, Mexico, Singapore, the Marshall Islands, and 44 European countries that have already announced their airlines are in. Trade carbon. Representatives at ICAO are looking to establish a “market based mechanism,” whereby the rights to emit carbon dioxide would be capped, allocated, and traded among participating airlines. Airlines that can reduce emissions cheaply could sell unused emission rights to other companies that find it more difficult to do so. This is a smart set-up. All airlines would have a financial incentive to reduce their emissions, and carbon trading represents the cheapest, easiest way to meet a climate target, thereby minimizing fare increases on flyers. Cap-and-trade has now been tested and refined though experiences in Europe, New England, California, and elsewhere. Many observers hoped to see a global carbon market emerge from the Copenhagen climate summit in 2009. ICAO can now succeed in taking cap-and-trade global where national governments failed seven years ago. Look to the forests. Airlines should do what they can to reduce emissions in their own operations (e.g., fuel efficiency, newer-model planes, and more passengers per flight). However, aviation is one of the most expensive sectors for reducing emissions. Even if airlines roll out operational improvements and new aircraft technology, ICAO still foresees airlines falling somewhere between 6.1-8.2 billion tons short of their collective target from 2021 to 2040—roughly the amount emitted by Turkey or Ukraine over the last 20 years. One of the best ways to close this gap is for airlines to purchase credits for reducing emissions from tropical deforestation. Emission reductions from tropical forests are potentially sizable, with tropical deforestation projected to emit around 94 billion tons over the same time period. They are affordable—Brazil slashed Amazon deforestation over the last decade by around 80 percent, for around one-third the cost of the Rio Olympic Games. And they are up for grabs—for the most part they are not already included in forest countries’ unconditional climate pledges; rather these countries are waiting for potential buyers to show them the money. Use the latest model: REDD+. A commitment to buying offsets from tropical forest protection brings up question of which standards to use. Airlines may be tempted to go with what they know, for example tree planting projects certified through the Kyoto Protocol’s Clean Development Mechanism. When CDM was established in 2001, credits for avoiding tropical deforestation were deliberately excluded due in large part to technological inability to measure them. However, in the decade-and-a-half since the UNFCCC excluded forests from the CDM, satellite monitoring has experienced a technological revolution. It's now possible to consistently and accurately monitor deforestation over large areas and long time periods. As we describe in Why Forests? Why Now?, these technological advances led to political breakthroughs at the UNFCCC, reflected in Article 5 of the UNFCCC Paris Agreement, which endorses payments for verified national- or state-level reductions in emissions from deforestation (REDD+). ICAO should ideally specify REDD+ among the list of allowable options for offset supply; at the very least it should not foreclose this promising option. Specific methodological details can be saved for later meetings. Forests are a great match for airlines, but airlines are a great match for forests too. Previous REDD+ initiatives have yet to generate the large, predictable demand for protecting forests that tropical countries are craving. Bilateral deals between Norway and Brazil, Guyana, and Indonesia have successfully established proof of concept in paying for reduced emission reductions; the Carbon Fund may also do so soon while the Green Climate Fund may do so eventually. But these publicly funded programs are fundamentally limited by aid levels and conditionalities, as described in the CGD working group report Look to the Forests. California’s cap-and-trade program, if it accepts tropical forest credits, is vitally important for setting high standards for regulatory offsets, and could grow to include other states such as Quebec and Ontario, but is not expected to produce large demand initially. ICAO, on the other hand, has the potential to bring large and predictable funding for forest protection. If airlines purchased REDD+ credits to cover half their 2021-2040 gap, at a modest price of $5 per ton, it would provide countries that reduce deforestation with more than $1.5 billion annually—substantially more than the $1 billion or so currently going toward REDD+ every year. If airlines paid $10 per ton to cover their entire gap, forested countries would receive in excess of $6 billion a year. An alliance between airlines and tropical forests has vast potential to protect the climate—ICAO should signal all clear for takeoff.